From left to right: (top row) Jie Luo, Yuting Yang, Zhongqi Yao, Weixin Lu; (bottom row) Bo Hou, Zhi Hong Hang, C. T. Chan, and Yun Lai. 2Department of Physics and Institute for Advanced Study, Hong Kong University of Science and Technology, Clear Water Bay, Hong Kong. Transparent media are the foundation of almost all optical instruments, such as optical lens, etc. However, perfect transparency has never been realized in natural transparent solid materials such as glass because of the impedance mismatch with free space or air. 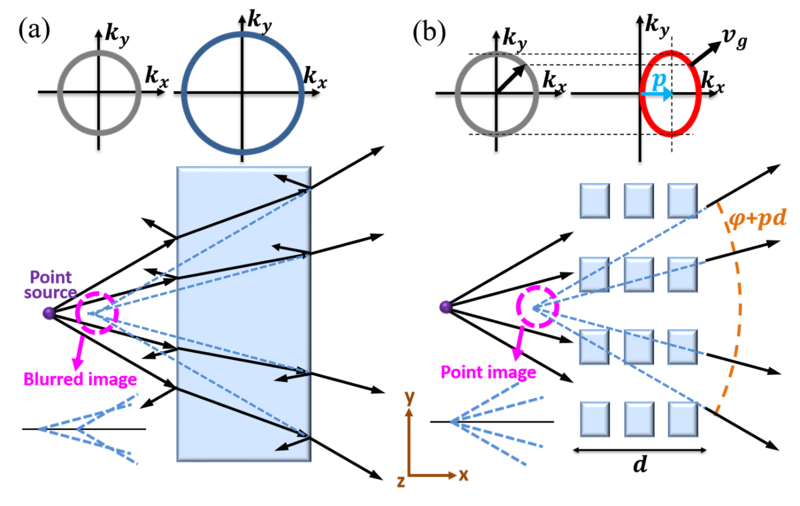 As a consequence, there generally exist unwanted reflected waves at the surface of a glass slab, as illustrated in Fig. 1(a). It is well known that non-reflection only occurs at a particular incident angle for a specific polarization, which is known as the Brewster angle effect . Our question is: is it possible to extend the Brewster angle from a particular angle to a wide range of or all angles, so that there is no reflection for any incident angle. In addition, the virtual image formed by a glass slab placed in air is usually blurred to a certain extent [Fig. 1(a)]. Such a blur indicates the aberration of virtual images, and is caused by the mismatch of equal frequency contours (EFCs) between air (grey lines) and the glass (blue lines). Figure 1: (a) Virtual image formation through a glass slab, with general reflection and aberration. (b) Aberration-free virtual image formation through an ultratransparent photonic crystal without any reflection due to omnidirectional impedance matching. The black arrows and blue dashed lines in represent the light rays from a point source, and the back tracing lines, respectively. The yellow dashed curves in (b) indicate equal phase surfaces of transmitted rays. The inset graphs show the corresponding EFCs. The figure is adapted from Reference . The purpose of our work  is to explore the possibility of realizing the ultimate transparency by artificial optical structures such as photonic crystals (PhCs)  and metamaterials . In other words, we pursue the realization of transparent media with the extreme property of omnidirectional impedance matching and the ability of forming aberration-free virtual images, which are hereby denoted as ultratransparent media. In this work, we propose that omnidirectional impedance matching can be realized by utilizing effective medium with nonlocal parameters, i.e. permittivity and permeability that are dependent on the incident angle. Interestingly, such an effective medium can be realized by using pure dielectric PhCs. Moreover, the EFC of the ultratransparent PhC can be tuned to be a shifted ellipse (red lines) with the same height of the EFC of air (grey lines). By using ray optics, we prove that such an EFC endows the valuable ability of forming aberration-free virtual images, as presented in Fig. 1(b). Because of the shift of EFC, the PhC is beyond the local medium framework, and effective parameters are nonlocal (i.e. spatially dispersive). Interestingly, such nonlocality leads to additional phase modulation p d, where p is the shift magnitude and d is the slab thickness [Fig. 1(b)]. Figure 2: (a) Illustration of the unit cell of the ultratransparent PhC. (b) The EFC of the PhC. 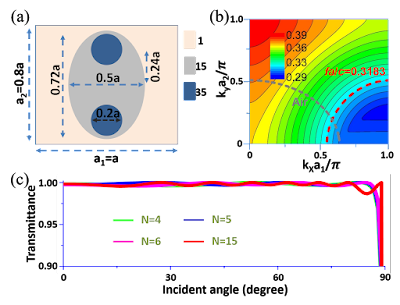 (c) Transmittance through the PhC slab with N (=4, 5, 6, 15) layers of unit cells as functions of the incident angle. The figure is adapted from Reference . An extreme example with almost complete transparency (T>99%) for nearly all incident angles (-89o, +89o) is shown in Fig. 2. The PhC is two-dimensional and its unit cell is shown in Fig. 2(a). For transverse electric polarization, at the working frequency, the EFC is a shifted ellipse (red dashed curve) with the same height as that in free space (grey dashed curve), as shown in Fig. 2(c). The transmittance through such a PhC slab is always near unity (>99%) for nearly all incident angles (<89o), and is almost irrespective of the layer number, N.
Figure 3: (a) Photo of the simplified PhC composed of alumina bars (white) placed inside the microwave field mapper. (b) The EFC of the PhC. (c) Transmittance through the PhC slab in simulations (solid lines) and experiments (triangular dots) and an alumina slab having the same thickness (dashed lines) as the function of incident angles. The figure is adapted from Reference . To prove the theory, we performed proof-of-principle microwave experiments by utilizing a simplified PhC consisting of rectangular alumina bars in a square lattice, as shown in Fig. 3(a). Such a PhC exhibits a shifted elliptical EFC [Fig. 3(b)] and a wide-angle impedance matching effect. 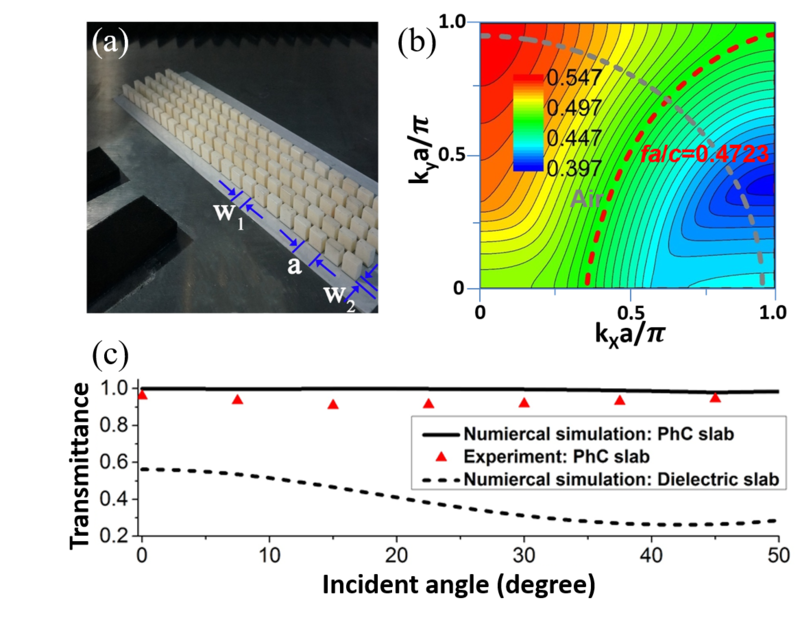 The measured transmission data (triangular dots) and simulation results (solid lines) both show high transmittance, which is great enhancement compared to the transmittance through an alumina slab with the same thickness (dashed lines). Finally, we also note that such ultratransparent media can extend transformation optics (TO) [5, 6] to the general realm of nonlocal media. The traditional TO was founded in the local medium framework and require local media. Here, we demonstrate that ultratransparent media with controllable refractive indexes are also good candidates for TO applications such as invisibility cloaks. Interestingly, due to the nonlocality, the ultratransparent media also enable additional freedom in phase modulation, which is absent in the traditional TO. At optical frequencies, ultratransparent PhCs exhibit the significant advantages of omnidirectional impedance matching, low loss and micro fabrication requirement. The concept and theory of ultratransparency gives a guideline for realizing the ultimate transparency which is broadband, omnidirectional and polarization-insensitive. Recently, we designed broadband, wide-angle and polarization-insensitive transparent media by using one-dimensional dielectric PhCs . In the future, ultratransparent solid materials may be optimized to exhibit an unprecedented level of transparency and produce no reflection at all in certain ranges of frequencies. John D. Jackson, "Classical Electrodynamics" (3rd edition, Wiley, New York, 1975). 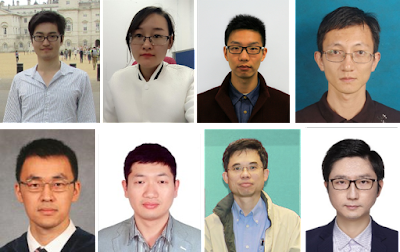 J. Luo, Y. Yang, Z. Yao, W. Lu, B. Hou, Z. H. Hang, C. T. Chan, and Y. Lai, "Ultratransparent media and transformation optics with shifted spatial dispersions", Physical Review Letters, 117, 223901 (2016). Abstract. John D. Joannopoulos, Steven G. Johnson, Joshua N. Winn, Robert D. Meade, "Photonic Crystals: Molding the Flow of Light" (2nd edition, Princeton University Press, Princeton, USA, 2008). Yongmin Liu, Xiang Zhang, "Metamaterials: a new frontier of science and technology", Chemical Society Reviews, 40, 2494-2507 (2011). Abstract. J. B. Pendry, D. Schurig, and D. R. Smith, "Controlling electromagnetic fields", Science, 312, 1780-1782 (2006). Abstract. Ulf Leonhardt, "Optical conformal mapping", Science, 312, 1777-1780 (2006). Abstract. Zhongqi Yao, Jie Luo, Yun Lai, "Photonic crystals with broadband, wide-angle, and polarization-insensitive transparency", Optics Letters, 41, 5106 (2016). Abstract.